It may not be part of your daily cleaning schedule, but it typically requires significant planning and manpower. You often need to hire a cherry picker, complete a ‘working at height’ risk assessment, and close part of your factory, which is not ideal. It doesn’t help that this considerable effort tends to result in clean (ish) walls which need cleaning again after a few shifts! At this point, many manufacturers would empathise with the customer and walk away wishing they had a solution. 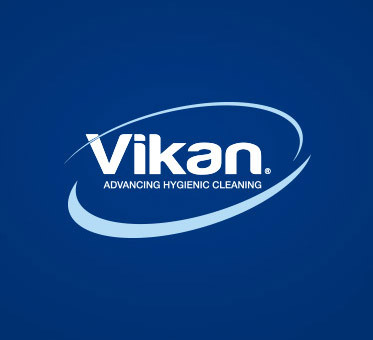 Fortunately, from our experience across many sites, at Vikan we do! On hearing this news, my customer was sceptical, but hopeful the promised demonstration at my next visit would solve his worries. The Window Mop, as it is known, was originally designed for glass. However, it removes dirt, grease and bacteria from surfaces such as vinyl, metal, plastic and Perspex using just tap water. You simply place this onto the mop frame via a Hook and Loop system and attach the frame to our extendable telescopic handle. This enables you to clean up to 5 metres in height, using just tap water. After spraying the mop with tap water, I began cleaning the walls. Microfibres are 1/50th of the thickness of a human hair, which means they are fine enough to get under and remove dirt and bacteria from a surface. After a couple of passes over the walls, our end-user couldn’t believe how quickly we had been able to clean what would usually take him hours! All this without the need for any chemicals. He grabbed the equipment out of my hands and off he went, cleaning not only walls but also the stainless steel casings on large equipment. Safe to say, what was once a massive headache can now be cleaned quickly and in turn, more often. This means the walls are now cleaner for longer and one less thing to worry about. The equipment is available at nominal cost and saves you money on labour, equipment hire, chemicals, not to mention the hygiene benefits from using microfibre. All textiles come with a 500 wash AND use guarantee, meaning if you were to use them once a day they would last 18 months. Just simply wash them in a machine on a regular wash and they will be ready to use again and again. For more information on how our award-winning ultra microfibres can benefit you, please contact me at asc@vikan.co.uk.